Global Magnesium Phosphate Market size was valued at over USD 1 billion in 2017 and is anticipated to grow at over 4% in the forecast timespan. Strong outlook in pharmaceuticals, fertilizers, food & beverages and feed application will propel the magnesium phosphate market growth. Advancement in biomedical sector to treat skeletal disorders including arthrodesis and osteoporosis has enhanced the product utilization in healthcare industry. Potential applications as bone graft substitute due to its efficient mechanical properties, biodegradability and biocompatibility will propel demand. In addition, increasing product usage in nanoparticle form as drug delivery vehicles and composite scaffolds production will drive the product demand. Increasing government focus on healthy lifestyle and food safety awareness along with standardized dietary reference intakes for magnesium phosphate and other nutrients, developed by FNB will support the product scope. Rising product demand for glycolysis, oxidative phosphorylation, energy production, DNA synthesis and bone structural development will drive industry demand. Potential applications as pharmaceutical active ingredients will drive the industry growth. Magnesium as well as phosphate are active ingredients for energy production and help in fuelling body’s cellular processes including nerve conduction and muscle functions. Strong outlook in feed applications to enhance the livestock health will propel the magnesium phosphate demand. According to NRC (National Research Council), minimum product intake for dairy cow should be 0.2% of dry matter. Shifting preference for mineral rich feed products to enhance milk production, immunity and prevent hymagnesaemia in ruminants will fuel the industry growth. Inclination towards farm yield enhancement to increase crop cultivation among farmers has stimulated the fertilizers demand. High application scope in bakery industry as leavening agent has enhanced the product demand. Enhancing moistness in baked products and imparting uniform cell structure are among key properties driving the magnesium phosphate market size. Raw material insufficiency along with increasing product demand are among major factors influencing the magnesium phosphate price trend. Uneven geographical distribution for phosphoric rock reserves influencing production rates may hinder the industry growth. Moreover, substitute developments through material science advancement may hamper product demand. Dimagnesium phosphate market registered over 245 kilo tons demand in 2017 due to its wide usage in bakery applications as leavening agent to improve dough rise and fluffiness. In addition, increasing product usage in stabilizing meat products by retaining water content will propel the industry growth. The product is also used in combination with salts for binding meat pieces in a reformed product. Moreover, the product is also used in cheese preparations to improve pH balance and enhance spreadability. Trimagnesium phosphate will witness growth at around 3.5% up to 2024. Rising product demand as nutrient and dietary supplements will propel the product demand. Improving blood sugar to energy conversions coupled with regulating neuromuscular heart activity are among key properties driving the product scope in nutrient supplement applications. Fertilizers will witness a notable growth up to 2024. Necessity for mineral enrichment and maintaining the phosphorus content in soil has enhanced the product demand in fertilizer applications. Enhancing starch & sugar utilization, improving cell division, photosynthesis and nucleus formation for plant growth will stimulate the industry growth. Food & beverage application accounted for significant market share in 2017. 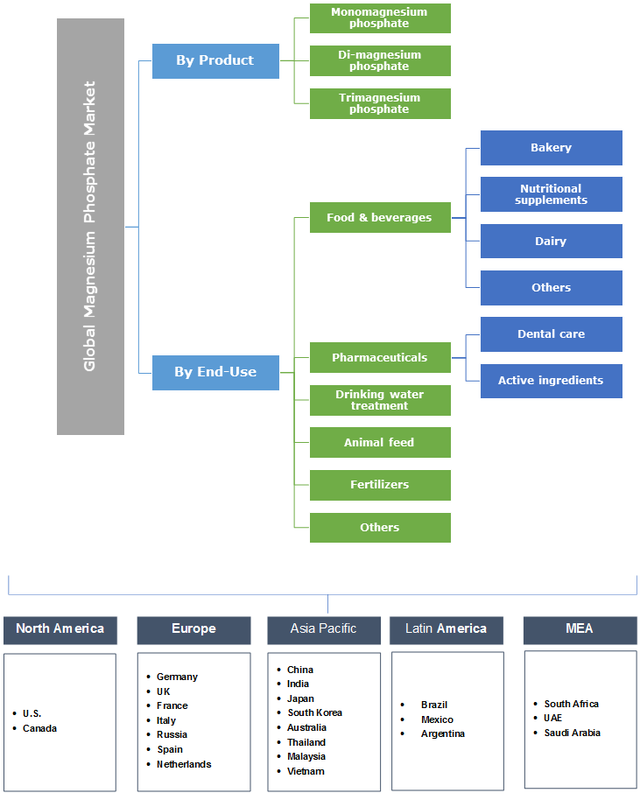 Strong outlook as acidity regulator, leavening agents, anticaking agents and other food additives will propel the magnesium phosphate market size from food & beverage applications. Significant health benefits including enzyme activity regulation, enhanced energy production and maintaining mineral balance will drive the industry growth. Reduced chances of hypertension, diabetes and heart diseases will further provide a positive outlook for product demand. Asia Pacific magnesium phosphate market is anticipated to worth over USD 700 million by 2024. Favourable socio-economic conditions particularly in China and India has enhanced the overall food and fertilizer grade product exports in recent years. As per Mosaic estimates, Indian phosphate shipments reached around 9.4 million tons in 2017. Increasing government focus on farmer training to improve plant growth, yield and crop nutrition will support the business growth. 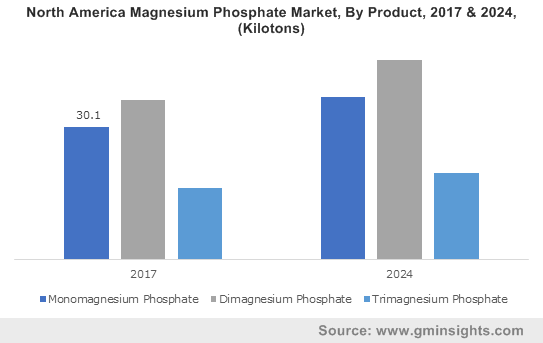 North America magnesium phosphate market will witness growth at over 3% up to 2024 owing to notable product usage particularly in biomedical applications. As per CDC estimates, the U.S. arthritis incidences will reach 78.4 million by 2040. Increasing consumer spending in dental care and orthopaedics due to large geriatric population in the region will support industry growth. Implant coating, bone scaffolds and bone cement are among major applications in healthcare industry. Moreover, increasing R&D investments to develop nutrition rich products will drive the industry demand. Magnesium phosphate market share mainly include Jostchemical, Innophos, Refractory Minerals Company, Triveni Chemicals, KRONOX Lab Science and Celtic Chemicals. The global industry share is highly fragmented with presence of both well-established and regional players. Other notable players include Anmol Chemicals Group, American Elements, Nithyasri Chemicals, Powder Pack Chem, Nikunj Chemicals, Redox, Shanpar, Pacific Chemicals Company, Hap Seng, Nexgen Chemicals and Manus Aktteva Biopharma. Strategic R&D investments, mergers & acquisitions and supply agreements to gain a larger market share are among major strategies observed among the manufacturers. In 2017, Innophos acquired Nutra Genesis, a U.S. based nutraceutical company worth USD 28 million to strengthen its position in nutraceutical markets. Technology advancement in pharmaceutical and agricultural industry will propel the global phosphoric acid demand. Rising product usage as a DNA carrier will enhance the industry expansion. Moreover, high application scope in fused fertilizers & water treatment applications will propel the industry growth. Increasing phosphoric acid demand to provide mild acidic flavour particularly in soft drinks will enhance the product demand in food & beverage applications. Growing nutritional & dietary product demand particularly in developed regions are expected to have a positive outlook for business growth. Increasing geriatric population globally will propel the industry demand. Rising product adoption in preventing kidney stone will enhance the product demand. The efficient product usage to reduce corrosion susceptibility in metals will propel the industry growth.